This is going to be awesome! Brian Vernor, CX, Live Music and Beer, how can you go wrong. 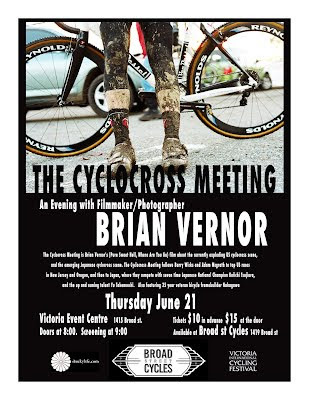 Brian Vernor will be on hand to showcase some of his photography and screen his film "The Cyclocross Meeting". Tickets $10 - Available at Broad Street Cycles (1419 Broad Street, 250-385-1739). Get them while they last!